By Chris Williams: Manny Pacquiao doesn’t plan on retiring just yet, as he wants a rematch against WBO welterweight champion Jeff Horn, says Top Rank promoter Bob Arum. The rematch between them could take place in November in Australia. It would be in front of Horn’s fans, again. Pacquiao lost to the unbeaten Horn (17-0-1, 11 KOs) on July 2 in Brisbane, Australia, and he did not shine in that fight. Pacquiao, 38, fought like an aging fighter, who couldn’t throw enough punches to get the job done against a fighter that was there for the taking. Horn, 29, would have likely been a sitting duck against any of the top welterweights in the division in that fight. Horn had the perfect guy for him to beat in the smallish and older Pacquiao, and he had a referee that took hands off approach when it came to control his fouls. Pacquiao felt that he should have won the fight, and he appealed the decision to the World Boxing Organization. The WBO had he Pacquiao-Horn fight reviewed by 5 independent judges, and they overwhelmingly had Horn winning. All they could do was just the fight and pick a winner on review. Pacquiao will likely need to agree to a smaller cut of the loot for the rematch to make the fight happen. Horn is now the WBO strap holder, and Pacquiao a mere challenger. Whether than means Pacquiao will need to accept less than a 50-50 deal is the big question. It’s kind of sad to see how Pacquiao’s has ended up. He loses to a largely mediocre fighter, who roughs him up for 12 rounds in his home country. The real sad part is how Pacquiao even agreed to fight Horn in Australia. I can’t believe Pacquiao did that. The Pacquiao that was at his zenith between 2009 and 2011, likely would have laughed Arum out of the room if he suggested that he go over to Australia to fight a little-known school teacher named Jeff Horn. It just shows you how far Pacquiao’s career has dropped since his loss to Floyd Mayweather Jr. in 2015. It’s not just that fight though. I think there’s been many fights that haven’t helped keep Pacquiao’s popularity high. Putting him in with these guys were not good moves: Brandon Rios, Chris Algieri, Joshua Clottey, Antonio Margarito, Shane Mosley, Jessie Vargas, Tim Bradley [in fight No.3] and Jeff Horn. I think that was bad match-making. If the idea was to keep Pacquiao popular, then putting him in with those guys was the wrong move by Top Rank in my opinion. “Once I have an answer from the Senate when they have their recess, I will go to my partner in Australia, Duco [Events], and we will figure out where we’re going to do the fight,” said Arum. 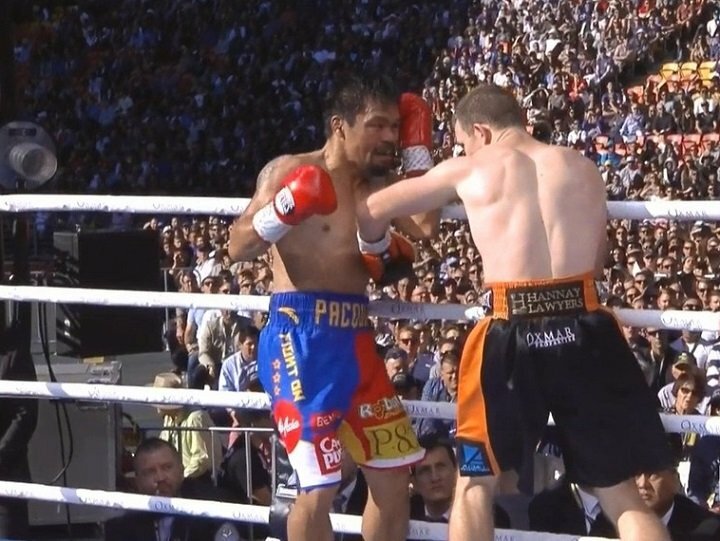 it’s possible that Pacquiao will retire if he gets beaten again by Horn. If he wants to avoid losing another fight against Horn, Pacquiao is going to need to make sure he doesn’t let the fight go to the scorecards. Horn is a popular fighter in Australia, and the crowd is going to be firmly on his side for this fight. Pacquiao can take the judges out of the fight if he throws a lot of punches. Pacquiao showed in the 9h round of their fight on July 2 that Horn cannot do much when he’s throwing a lot of shots. Horn is like a punching bag. He’s got zero defense, and he mainly does well when Pacquiao is standing and not throwing punches. Pacquiao can win this fight if he wills himself to be busy and up his punch output from what he did in the previous fight. Pacquiao would need to work on his conditioning to build up some endurance for him to let his hands go. He looked like he wasn’t well trained for the previous fight against Horn. It’s not surprising. Pacquiao is now a politician and he doesn’t have the time to work on his cardio like he did before he went into politics. In hindsight, Pacquiao should have waited until he was done with his boxing career before he ran for a seat in the senate in the Philippines. If Pacquiao until he was 40 to run for a senate seat, he would have furthered his career and he likely would have never lost to Horn. Of course, Pacquiao has made a lot of questionable decisions over the years. Some boxing fans wonder why Pacquiao re-signed with Top Rank. They feel that he would have made more money and had more access to other fighters if he had become his own promoter like Floyd Mayweather Jr. did. By re-upping with Top Rank, Pacquiao has fought Bradley, Vargas and Horn. If he hadn’t re-signed, it would have been interesting to see if Pacquiao could have fought guys like Amir Khan, Adrien Broner, Keith Thurman, Danny Garcia, Errol Spence Jr. and Shawn Porter. Those would have been good fights for Pacquiao if he could have won them. Pacquiao’s popularity would have remained high if he’d faced those guys and beaten them.